Sarah Elizabeth Aderhold was born 24 Dec 1817 in Lincoln County, NC. She was the daughter of Jacob Israel Aderhold and Elizabeth Heavner. 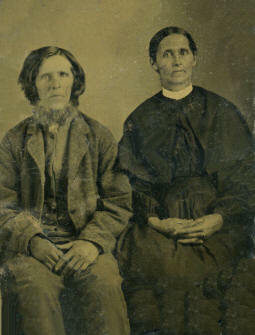 Sarah married Miles Franklin Witherspoon on 11 Nov 1844 in Lincoln County, NC. Miles was born 13 Mar 1817 in Lincoln (now Catawba) County to Thomas Wesley Witherspoon and Margaret Rankin. Sarah's youngest brother, John Jacob Aderhold, married Miles' youngest sister, Anna Witherspoon, on 13 Nov 1843. Sarah and Miles had at least eight children. 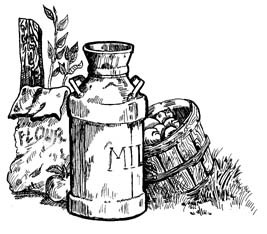 Sarah died 08 Nov 1887 in Catawba County, NC. Miles Rankin died 09 Feb 1892. They were both buried in the Bethlehem Methodist Church Cemetery in Claremont, NC. Sarah's headstone was broken sometime in the past but an attempt to repair it has been made. visit the Miles Rankin Witherspoon page. Thanks to Daisy Lemyre Sigmon for sharing this photo (a tin-type) with me many years ago. If you have additional photos or information on the Aderholdt Family, please contact me.